So, you want to be a sardine? Once there was a fish named Arlene, who wanted to be a sardine. She wanted to be a sardine just like the silvery, salty fish that you see in those little tins at the grocery store. 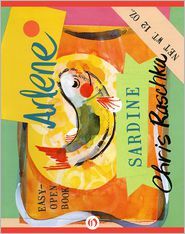 With the bold brushstrokes of his vibrant illustrations, Chris Raschka follows Arlene's journey from a fjord to a big net to a briny bath aboard a fishing boat. And he reveals just how to get packed like a sardine!